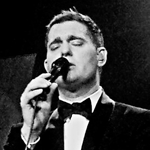 A small selection of Michael Bublé vocal arrangements for solo vocalist with big band. Born in Burnaby, Canada, he is a Canadian singer, songwriter and record producer. Some have dubbed him as the modern day Frank Sinatra. From early beginnings he has gone on to win four Grammy awards, all of them in the Best Traditional Pop Vocal category, and twelve Juno awards. Four of his best known albums are "It's Time", "Call Me Irresponsible", "Crazy Love" and "To Be Loved". He continues to record and tour worldwide. What do we have for you here? We only have a few charts to offer you at the moment, though will look to add more in the future. We have "Me and Mrs Jones", "The More I See You" and "All of Me". MB used out chart on his Crazy Love album.